Portugal beat Ghana Thursday 2-1 with goals from John Boye (OG) in the 31st minute and Cristiano Ronaldo (80th minute) overcoming the second half strike by captain Asamoah Gyan. Majid Waris will rue a chance to give Ghana the lead in the 61st minute with the game finely balanced at 1-1. 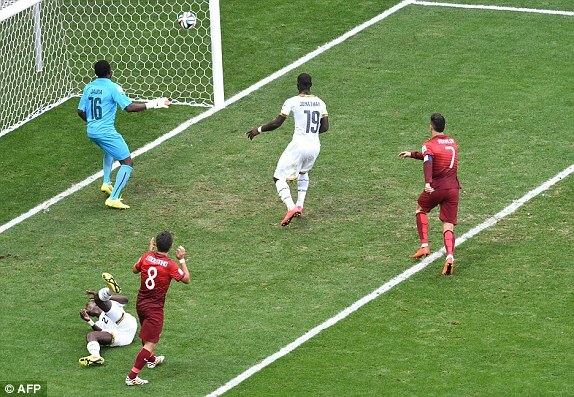 Fatau Dauda will regret palming a floated ball meekly into Ronaldo’s path for Portugal’s second goal. It was a ball Dauda should have caught easily with greater command and confidence. There were highlights, albeit few. Kwadwo Asamoah’s cross for the goal was exquisite. His defending as always was steady. Dede Ayew’s confidence and maturity in this game show a continued growth. At 24 and with 50 caps to his name already, Ayew could continue building a legacy of his own over the next decade of serving the national team. Harrison Afful continued where he left off against Germany and Asamoah Gyan single handedly posed a threat to the Portuguese with his determined running. Overall though, the players seemed to be going through the motions, unable to summon the requisite energies to overcome the off field drama that took place before the game. They were listless at times and seemed to lack that extra effort they delivered against Germany. They also seemed to lack an effective game plan to expose a weak Portuguese side. More than the loss of a match, the entire team will be counting their collective losses. A loss of focus on their Portuguese opponents and overall mission brought on in the aftermath of a now widely reported incident between Sulley Muntari and a member of the Ghana Football Association, Moses Parker. They will wake up USD100,000 richer but with a loss of reputation, respect and pride, values whose worth is incalculable. Rather than adding to their reputations as Africa’s darlings by overcoming their ‘oh so close’ loss to the US in the first match and their brave display against the Germans by beating the ‘Cristianos’ and becoming one of three African representatives in the second round, we played into the ‘just another African country’ condescension. Instead of bringing joy to the faces of Ghanaians who Lord knows need all the joy they can get and winning more followers faster than you can say TB Joshua, our Black Stars’ indelible mark will be that of mercenaries employed to wear the jerseys of a country and content to shoot at our collective hearts. And so it is. They come home with no glory, no joy and little pride. Oh, and no gas to fuel their big fancy cars. In picking up the pieces however, we must look at more than the players’ conduct if we want to seriously fix the problems that beset this campaign and have perhaps threatened to derail others. Four years ago, France went through a turbulent time. They approached it by not only taking action against some players perceived as ‘troublemakers’, they looked holistically at their preparations and are back strong this year. We are relative novices at this World Cup business and if it is our ambition to become mainstays and one day soon challenge for the Cup, we have to take a long hard look at ourselves. Kwesi Appiah is clearly very committed to the 4-4-2 that served him so well in qualifying. When Ghana is firing on all cylinders it can be beautiful to watch. The strategy carries risk though that we weren’t able to overcome. We scored four and conceded six goals in Brazil, an average of two a game and a -2 differential. In South Africa, we conceded four and scored five a +1 differential. Even without those statistics, it was clear to see that we were weaker defensively. And all our opponents capitalized. For a former defender those statistics would be disheartening to Appiah. More disturbing though is how inadequate we have been in correcting those mistakes. It’s one thing to have ‘silly mistakes’ in one match but the likelihood that we’ll concede must be assuring to any opposing coach and makes it easier to game plan against us. Majid Waris is a talented player who Ghana can rely on certainly for the next few years if he continues to develop. The injury in the final warm up match against South Korea was unfortunate as it robbed us of one of our more in-form players. He was one of the young players many tipped to shine at this World Cup. There was a yearning by many to see Waris on the field. Yet, his inclusion in the starting line up for the final group match was questionable. He was essentially playing his first competitive game in over two weeks. He was clearly not match fit and but for a glaring miss did not impact the game like he usually does. However, in a pattern that I fear is emerging and that might indicate an indecisiveness on Appiah’s part, he reacted to what others were saying. We saw this when he changed Adam Kwarasey before the Germany game and for me he reacted to the disappointment at Jordan Ayew’s mistakes in the Germany match by benching him. Andre Ayew was substituted in the match Thursday’s match and I could not understand it. Ayew has become if not yet the Black Stars best player, the player that provides inspiration at moments when we are low. He is the one with the ‘never say die’ or ‘I will die for my country’ attitude at all times when he’s out there. More practically, he is the only player outside of Gyan to have scored in this World Cup. Why take out a goal scoring threat when you need goals? I tweeted during the game last night that while Christian Atsu is a very talented player, he won’t become as great as his talent suggests he can be if his decision making doesn’t improve. The nickname ‘African Messi’ is an exaggeration that is unfair to Atsu and an insult to Messi. Leo takes his chances. Messi is not just a dribbler. He influences a game by being a constant threat to make that incisive pass, have a shot that at least tests the keeper or take off on a dribble with the back of the goal not too far away. Atsu is pleasing to the eye but his end product is far too often wayward. Kwadwo Asamoah is one of those players who excelled at this tournament and can hold his head high. He gave an honest, committed effort. But he is NOT a left back. Period!